Hi there! Remember me? No I’m not dead, gone, or any other theory. I’m also ok, though I appreciate the number of e-mails and such that I received inquiring about me and my well being. Truth is, I’ve spent the past six weeks or so since I posted just living the day to day life. Whether being a dad, working, or doing things around the house…you name it. It was just one of those lengthy periods where I wasn’t logged on to the game and when you’re not…it’s hard to write about it. Sure, I could talk about the flow of WoD information that continues to come out in light of Blizzard flipping the Beta switch recently. Honestly, there are enough sources out there and enough people doing it that the subject is well covered. Personally, I’m not sure on how I feel about various things that I’ve learned and I’m taking a “wait and see” approach to things (Garrisons, I’m looking at you) rather than share my thoughts right now. Though I will say the mount flavour text is hilarious. I continue to dabble in Hearthstone, but even that’s been on the back burner during these few weeks -just less so than WoW because my son actually asks me to fire it up on occasion so that he can watch. Plus, it seems easier to play a quick game versus trying to accomplish anything with certain characters in Azeroth. I’m not complaining, just observing. The things I want to do require sitting down and focusing to some degree. Except for my Baradin Hold rep. Had I kept at the dailies instead of a complete hiatus, I’d have that Drake by now. C’est la vie. This isn’t to say I’m back in the swing of things either. It’s summer time so my schedule drastically changes for July and August so going to the computer is even less appealing. Though there are some holidays in there where I might be able to dabble a bit more thoroughly. Instead, I suspect it will be when school starts that I can spend some time truly immersed in the game once more. That it’s already been four years and the boy is even going to school to begin with is an adjustment in itself. One final note, I would just like to once again congratulate Cymre for making it into Warlords of Draenor as an NPC. I was incredibly excited for her when I heard the news. If you happened to miss it, here’s her post on the details. Many of us have always asked the question of what we’d want if we were to be in World of Warcraft and she’s the latest to have that wish come true! 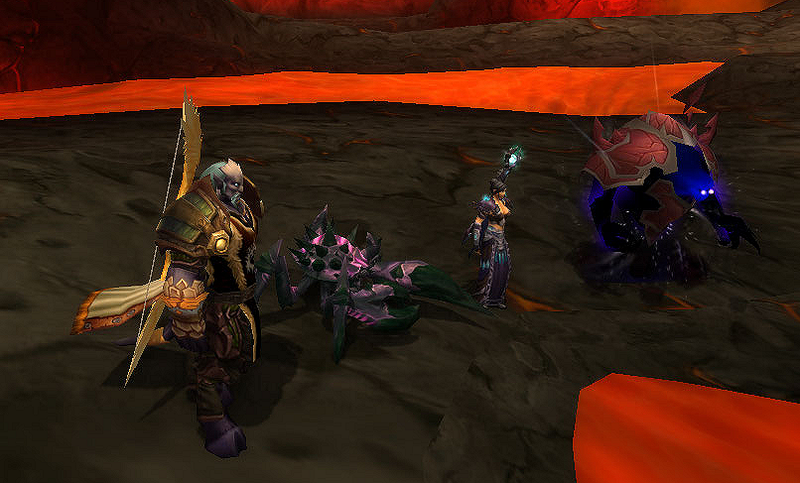 Thanks to Warlords of Draenor, we’re looking at a fresh batch of 90’s with some regularity. This will spike further when the game actually comes out (because some players want the physical version of the game, or the deluxe version). In a move that I applaud, Blizzard has come out with some Crash Course videos. Even for players who already have a 90 of said class, this isn’t a bad little cheat sheet as it were. Trust me, some players won’t know these things despite it being their main toon. For new players, or folks with an unfamiliar class, these are fantastic starting points. Unfortunately it only helps to boost the dps pool and even then you’re looking at only half the specs. I realize Blizzard could only devote so much time and energy into the concept, but it’s disappointing. I know healing and tanking can’t really be taught in a 90 second video, but even the other dps specs are left out in the cold. If you want to be a fire chucking Mage, Blizzard can’t help you. Only Arcane. Of course this is the world of instant media and information and we can very well look these things up. When I boost my Druid, I will most certainly be studying Feral and Resto much more closely. I know to do this. These videos don’t quite feel like I’m the demographic. It feels like they’re aimed more at new players than anything, and in such a regard should have taken the time to show all the specs. Again I admit tanking and healing tutorials are much harder and cramming one into 90 seconds would be tough, it still could be achieved in it’s very basic form. The question is then would we like the healers and tanks we would be getting out of it? Someone who tries to tank at 90 for the first time is going to be in much worse shape than someone who has done it previously, or even 85-90. Or even respecced at 90. At least said player still has a grasp of her class in the first place. Same goes for a healer. And they catch even more grief if something goes awry. It seems to be a damned if you do, damned if you don’t, scenario. But as someone with a healer and a bit of an out of practice tank, I would like to see them (Blizzard) at least encouraging people to try the roles. Even one of these videos dedicated to something other than dps would have been a good idea. Show players what they can do at a basic level and instead of saying “look at your abilities and glyphs and wing it,” put an emphasis on places like the forums and wowhead even (since they link to it in the armory anyway). Having people try and fail (or equally succeed) is better than not even showing them the option in the first place. Cim and Lioux, clearly impressed with Ragnaros’ great election speech. I made good on my promise to take Lioux to the Isle of Thunder. Unfortunately I didn’t consider how undergeared he still would be. The third scenario clearly illustrated that for me, though, and so I decided to putter elsewhere. I realized I didn’t have any of the Tempest Keep pets as of yet so that seemed like a logical choice. As I was talking to Tome at the time, I asked her if she wanted to go and so off the two of us went. Four bosses in Tempest Keep and three of them have the chance to drop a pet. Well, none of them did. I had this great theory that Kael’thas was just in a really good move and was saving our luck for the Ashes of A’lar. Yeah, theories aren’t always that practical. I followed Tome’s notion that we should then head into Molten Core. I hadn’t been there in a little while, probably once ever on Liouxpold, so I was game. Once again we had pet opportunities…and one managed to drop. We both happen to have the Ashstone Core, so even that wasn’t a huge victory. But, can you measure fun by the RNG? If you could, I would probably be miserable playing this game. No, the fun was had when just two friends on a whim decided to go bounding off into some old content. We didn’t find any pets or great drops that either of us needed, but we did find a good time together. Just the way it should be. If you aren’t familiar with the Liebster Award, it’s essentially a means by which bloggers get to know one another better. The one that I know of, and was nominated in, involves the number 11. The nominee asks 11 questions of you, you also include 11 random facts. After that, nominate 11 people and drum up 11 questions for them. I was nominated by Lorelei back at the beginning of the month, and must pause to point out how incredibly flattered I was by that (even if I was horrible and didn’t even notice until someone mentioned that I had already been nominated). So let’s delve into things shall we? We’ll start with Lorelei’s questions. I think my blogging started around 2003 and for the most part it was a way for me to write down the randomness that is my thought patter. 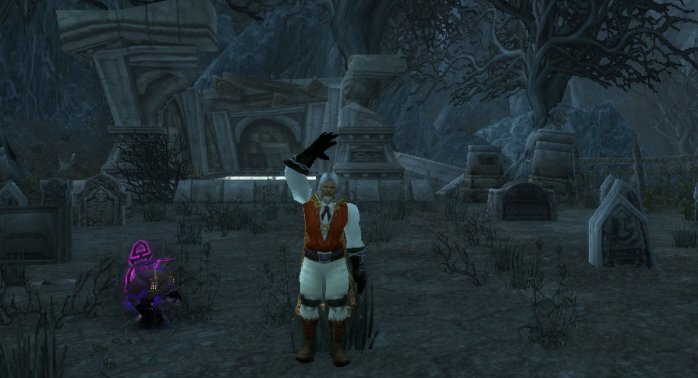 Switching over to this particular blog, I started in 2008 and it was originally meant for me to chronicle my Azeroth adventures via my various characters. That plan didn’t work out very well for me, if you take the time to go back through the annals of this blog. 2. What Inspires You To Keep Blogging? Most people know I essentially stopped blogging last year because I wasn’t playing the game. I occasionally tossed up snippets of thoughts, but I couldn’t fairly blog about something I was no longer a part of…and believe me, for most of my hiatus I felt completely disconnected from the game. Now that I’m back playing, that in itself is more than enough. Once I’m in a writing groove, it’s basically as long as my mind has something to write about, I will most certainly keep doing it. As the saying goes, I write for myself. It’s an incredible bonus to have people seemingly enjoy hearing my thoughts on all things Azeroth related. Every author has a voice in their writing. In many cases, you’ll connect with it right away if it’s the kind of person you would want to chat with. You just know. It’s why Navimie and I, for example, just clicked right away. I also enjoy when the blogger shares thoughts and information, but does so in an informative way that isn’t just throwing 100% statistics and jargon at you. When folks can get their point across in a casual way, it makes things more enjoyable and easier to want to read. 4. If you had to describe yourself by comparing your personality to a game character/race, what character/race would that be? About three years ago I did a 20 days of WoW and I was asked pretty much the same question. The short answer is a Worgen Druid, but feel free to go read the original response to see the full explanation of how I came to that conclusion. 5. What are you Top 3 all time favourite PC/console games. Shining Force (Sega Genesis), Rollercoaster Tycoon (PC), World of Warcraft (PC). There’s a lot more that I could add to that list. Basically after Shining Force 2-10 are probably interchangeable depending on the day. 6. What PC/console games are you enjoying at the moment? 7. Do you enjoy playing any non-digital games? Dear Illidan, yes. Personal favourites are Ticket To Ride, HeroClix, and Killer Bunnies. We also have Cards Against Humanity but haven’t had a chance to try it yet. 8. What do you like to do in your spare time when you aren’t blogging or gaming? I have a boy who just turned four. Pretty much anything I can do with him until I need a sanity break. Other than that, I love cooking/baking/barbecuing, I’ve found enjoyment in gardening/yard work, and read when I can. 9. If you could spend a day in a fictional world, where would it be and why? Yeesh, this one’s tough. I think I would go with the afterlife in “What Dreams May Come.” For one, it’s (almost entirely) beautiful, and the chance to see lost loved ones, as well as have the knowledge for one day, for absolutely certainty, there is something more after we die. 10. What season of the year is your favourite? Winter. Here in North America (specifically southern Canada), I was in my glory this year. More snow that we could imagine and it never melted. It’s mild this week and there’s still snow trying to melt. Despite my heating bill, I was a very happy camper this winter. 11. If you could magically learn any language in the world, what language would you learn? Again, tough call. For a long time I could easily speak French as a second language but I have honestly forgotten a large chunk of it because I really haven’t used it over the last decade. I honestly don’t know, there’s none that really jump out at me. I was light infantry in the Canadian Military. I love to sing, and I’m absolutely terrible. I play Pathfinder/D&D, currently running my own world. For post-secondary I chose radio over massage therapy. I’m the only person I know who doesn’t like Frozen. My family tree goes from me into four different branches and then gets complicated. I’m a size 15 (US) shoe. If I could only watch one television show ever, it would be Arrow. My favourite musical artist is Pink. I know some have been idle bloggers, but perhaps this is just the nudge they need to get rolling again. I’m certain for 1-2, this just isn’t their thing and that’s understandable. Now then, for those who decide to partake, I present these thought pondering words for you. Presume you blogged regardless. 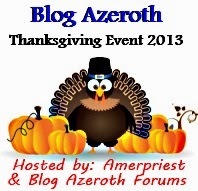 If it wasn’t World of Warcraft/MMO’s, what would your blog be about? Out of all the Caverns of Time, which one do you enjoy the most? The least? Is there a class in WoW you just can’t bring yourself to like? Are you a board gamer, or a pen & paper gamer…or just video games? What would you like to see Blizzard grant the Warcraft license to? What racial leader would you follow into battle, no questions asked? Many people point to Wrath as the pinnacle of the game. If you were introducing someone to WoW for the first time, what would you show them outside of that expansion? 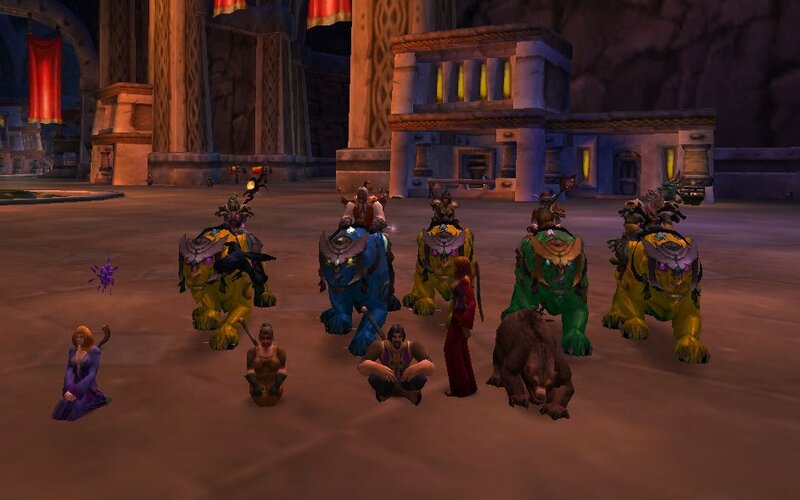 What’s your proudest WoW moment? Gold: Rich beyond words, enough to get by comfortably, or always needing to generate it for repairs? If World of Warcraft was gone when you wake up in the morning, what would be your fondest memory?